Mothers and widows of terror victims protest government policy to contain terrorism, lack of security in Judea and Samaria. 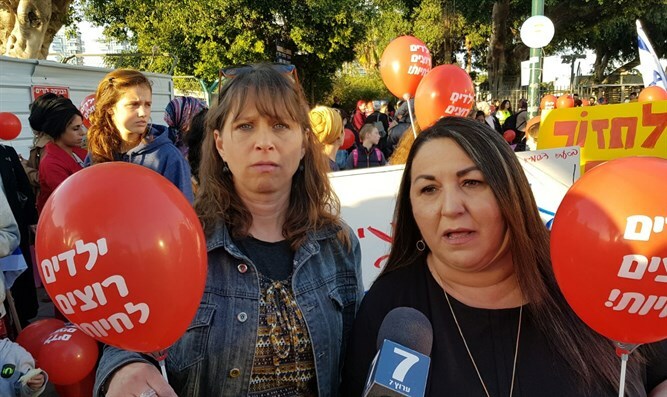 Dozens of mothers marched through the streets of Tel Aviv Tuesday to protest the government's policy on containing terrorism and to demand that the government provide proper security to the Jewish residents of Judea and Samaria. The march was initiated by the friends of Yael Shevach, the widow of Rabbi Raziel Shevach, murdered in a terrorist shooting attack in Samaria last week. Marchers carried balloons with the words "children want to live." The marchers included Dvora Gonen, mother of terror victim Danny Gonen, and Hadas Mizrahi, the widow of terror victim Baruch Mizrahi. "We want security, security, security," Hadas Mizrahi told Arutz Sheva. "It hurts so much that we have reached a situation where mothers and young children have to march to seek security." Dvora Gonen said: "I want to send a message to every mother in the State of Israel: we must seek security in every part of the country."